Sulzer is the leading independent service provider for rotating equipment, and offers repair services for vessels such as cruise liners, naval and passenger ships, tankers, offshore production and support vessels, and dredgers. We are dedicated to minimising downtime and maximising your profitability. Ship operators, ship owners and shipping agents turn to us for reliable support, including emergency call-out, site inspection, repair of all types of mechanical and electrical equipment, and in-situ repair and testing. Normally, large electrical rotating machines are removed from a ship in berth or dry dock. This often requires dismantling surrounding equipment or main support structures and cutting a hole in the ship’s side. Sulzer has the expertise to repair most rotating machines in-situ. Whenever you call us, our experienced and highly skilled engineers fly to meet the ship wherever it is, and provide the service that helps you minimise cost and downtime. While our engineers are onboard dismantling the equipment, we are manufacturing new coils at one of our special facilities around the globe. Once completed and tested, the coils are dispatched to the vessel in time for Sulzer’s engineers to seamlessly carry on with the repair. Our coil workshops are among the best-equipped coil manufacturing facilities in the world, capable of producing all types and sizes of AC coils and bars, DC coils and Rogowski coils. An in-house, highly sophisticated copper rolling mill has both inline and pot annealing facilities, enabling us to offer a round-the-clock coil manufacturing capability, with an incredibly short lead time on copper strip. Extensive stocks of continuously cast soft copper rod guarantee the ability to meet your demands immediately. Formed coils are produced on automatic shaping machines, which give consistent geometry and coil fit. Computer-controlled taping machines provide perfect lapping and consistent tension, giving built-in security of coil insulation. A range of electrically heated hydraulic presses up to 24ft (7m) guarantees highly accurate size and consistent control of pressed coil sides, ensuring a perfect slot fit. All packing and transportation of our products have to pass stringent quality controls so that the care taken in manufacture is in no way compromised en route to the customer. Sulzer’s commitment to quality is matched by our dedication to sustainability at all levels of our business. We work every day to ensure the health and safety of our employees, and the safety and integrity of the services and products we provide. At all our locations worldwide, we implement certified management systems according to ISO 9001, ISO 14001 and OHSAS 18001 as an effective way to sustain the continuous improvement of our processes and products. Sulzer's new end-suction single-stage centrifugal pumps are suitable for use in a range of industrial applications. Sulzer has entered into an agreement with Renova for the transfer of ownership of five million Sulzer shares, aiming to minimise disruption to business. Organic order intake increased by 2% and, including acquisitions, 12% in the last year. A low order backlog carried on from the previous year meant that, while sales grew by 5%, they declined organically. Sulzer has obtained JWC Environmental, LLC (JWC), a provider of high-engineered, mission-critical product removal. Sulzer is pleased to reveal it has acquired industrial pumping solutions company Ensival Moret. Sulzer is pleased to reveal that it achieved an order intake of Sfr757.6m during the first quarter of 2017, which marks a significant increase over the Sfr684.6m achieved in the same period in 2016. Sulzer has revealed that it has completed the acquisition of Ensival Moret (EM), a part of Moret Industries. Sulzer will immediately begin to integrate EM in its pumps equipment division. Combining the complementary product portfolios will allow Sulzer to become a full line supplier in most industrial process applications. On 25 November 2016, Sulzer entered into exclusive discussions with Moret Industries to acquire the pump manufacturer Ensival Moret (EM), a part of Moret Industries. The enterprise value for the proposed transaction is €80m (Sfr85m). The SMD pump range is suitable for a variety of high-volume flow applications where clean, raw, sea, or brackish water is pumped. Such applications are water transport, water abstraction, desalination, treatment, supply, and distribution. The pumps can also be used for drainage, firefighting or distribution of heating and cooling media in residential and industrial systems. Sulzer's product portfolio for the clean water market includes its efficient and highly reliable standard axially split casing SMD pump. In the first half of 2016, Sulzer's operational ROSA and operational EBITA continued to be stable. Order intake, impacted by oil and gas market headwinds, decreased, but increased by 8% sequentially in the second quarter of 2016. Significant savings from the Sulzer Full Potential (SFP) programme offset the impact from market headwinds. 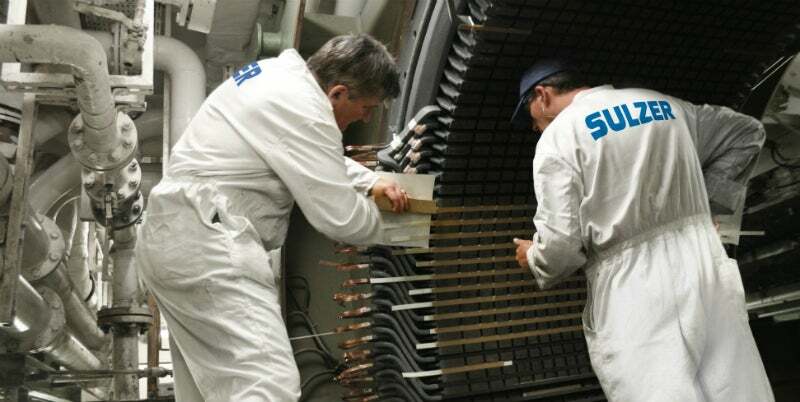 A refurbishment project for the hydro generator at Lochay Power Station has been awarded to Sulzer, which has a distinguished history in high-voltage generator refurbishment. Orders from the power, water and general industry markets improved, whereas headwinds in the oil and gas market remained significant. The new pump series is developed to the recirculation and pumping of activated sludge in wastewater treatment plants during the nitrification and denitrification process, as well as for the pumping of surface, storm and river water. It complements the submersible recirculation pump series ABS RCP. Sulzer's Birmingham Service Centre is continuing to invest in apprentices that are keen to learn new skills, as well as working towards full-time employment in a challenging and vibrant and industry. The centre for UK operations, which specialises in electrical and mechanical repairs of large rotating equipment, is looking for four new apprentices to join the programme in September. As the trend for passenger ferries and cruise ships to increase in size continues, the requirement for reliable and effective back-up systems remains a constant.